The Eastern grey squirrel is a very common tree squirrel in the eastern half of the US and Canada. They’re most often grey with a white underbody, but all-black and all-white variations are not uncommon. Eastern grey squirrels build their domed dens, called dreys, in the forks of trees, and are constructed of twigs and leaves. They also will use abandoned bird nests and woodpecker holes for shelter. Eastern grey squirrels are most active in the early part of the day and the evening, avoiding the worst heat of the day. They do not hibernate. They have a variety of vocalizations, including a squeak similar to that of a mouse, a chatter, and a raspy "mehr mehr mehr". Eastern gray squirrels eat a range of foods such as tree bark, many types of seeds and acorns, walnuts, and other nuts, and some types of fungi found in the forests. They are happy to inhabit residential neighborhoods, raiding bird feeders for millet, corn, and sunflower seeds. On very rare occasions, when its usual food source is scarce, eastern gray squirrels will also prey upon insects, frogs, small rodents, including other squirrels, and small birds, their eggs and young. Eastern grey squirrels will also frequently raid gardens and fruit trees. Eastern grey squirrels will frequently raid bird feeders; they are one of the few species that can descend a tree (or other vertical surface) head down, by turning is hind feet backwards to support their weight. Eastern grey squirrels can also cause significant damage to gardens and crops, including apples, strawberries, corn, and flower bulbs. If squirrels are seen in your trees, some kind of preventive action should be taken; squirrels can strip a tree of its crop in a short time. Grey squirrels may build a nest in the attic or in the exterior walls of a house, often to the consternation of the homeowner. Eastern grey squirrels quickly become habituated to visual or sound frightening devices and pay little attention to them after a couple of days. A number of these devices are on the market, but none have proven very effective. Tree squirrels are quick to escape when pursued by predators. Dogs that have full run of the yard might keep squirrels at bay. Predators in urban and suburban areas generally have little effect on tree squirrel populations. Trees that overhang roofs or are close to telephone lines should be cut back to slow the movement of squirrels about the yard. Screening or blocking all potential entrance sites such as small gaps under the eaves, overlapping roof sections, and knotholes, can prevent tree squirrel access to buildings. Because they often travel on overhead telephone lines, power lines, and fence tops, they frequently find entrances at about these heights. When even a small opening is found, they can enlarge it by gnawing. In the absence of an obvious entrance, they can gnaw and create an entrance into an attic. Sheet metal or 1/4-inch wire hardware cloth are suitable materials for closing entrances. When closing entry routes, be sure you haven’t screened an animal inside the building. One way to test whether any squirrels are left is to plug the entrance with a loose wad of newspaper; if any remain inside they will remove the plug to get out. It is virtually impossible to keep squirrels out of fruit or nut trees because of their superb climbing and jumping ability. Sometimes if there are other unprotected fruit or nut trees available to the squirrels, you can protect the crop of a single tree by netting it. While squirrels can readily gnaw through the plastic netting, they may not persist if sufficient alternative food is easily available. We suggest that a professional squirrel removal agent be contacted to solve your squirrel problem. Squirrels can be discouraged from digging up newly seeded or established crops by covering the rows with cage like freestanding covers made of one-inch hexagon chicken wire. Numerous devices and methods are commercially available from specialty catalogs for physically excluding tree squirrels from feeders; some of these work better than others. Tree squirrels are amazingly clever and agile so just about any feeder is susceptible. Complete a animal exclusion to your home! If you are tempted to trap or leave out poisoned baits for squirrels, it is best to check with a licensed pest removal company. 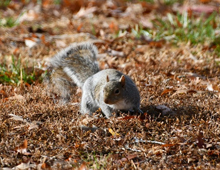 They will be up-to-date on all local laws concerning the animals; some squirrels are protected in some areas and either cannot be trapped or require a permit for their removal. Squirrels can also carry diseases and parasites that are transmissible to humans. Furthermore, professional pest control companies will be familiar with the most effective trapping techniques and approaches. Please choose the professional nearest you location by clicking on your State, Then your closest city to find a local animal removal professional! we also handle squirrel exclusions. Serving areas such as Fairfax,VA Dallas,TX, Los Angeles, CA Alexandria, VA Houston,TX Tulsa,OK Chicago,IL and many others!